Summer is in Full Swing in Winter Park, Colorado! Take a look at upcoming events and activities this month and plan to make your way to the mountains of Winter Park! 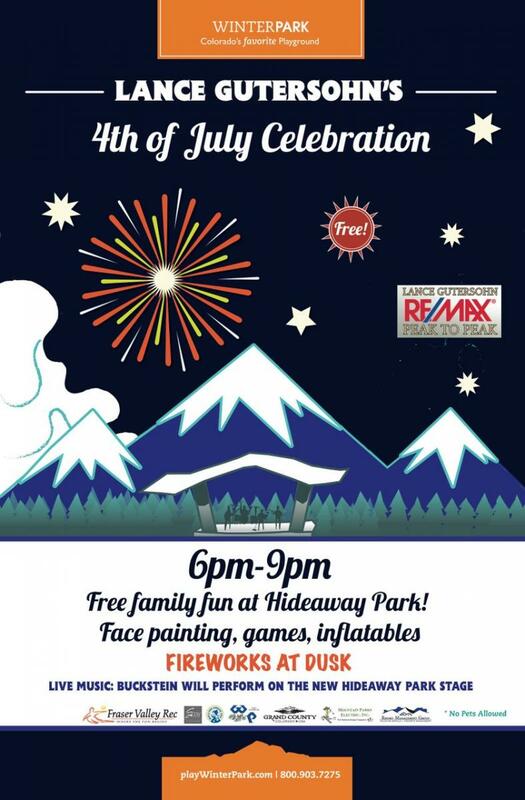 Come join us for an evening of free family fun with a magic show, face painters, live music by Buckstein, and fireworks at dark to celebrate Independence Day on July 4, 2017, in Hideaway Park, downtown Winter Park! Stop by one of our restaurants in the Town of Winter Park or Fraser and pick up dinner for the park. Find out about ALL Fourth of July activities, Here! Shows have begun for the Summer 2017 season at Rocky Mountain Rep, a World-Class Theater located in beautiful Grand Lake, Colorado, where each season promises to bring outstanding professional theatre to the Rocky Mountain region. Click here for show info and schedule! Join us for the 2017 Rodeo season at the High Country Stampede Rodeo. Rodeo season runs every Saturday night beginning July 1st- August 12th, 2017! Join us EVERY Thursday from 6-8pm in Hideaway Park, downtown Winter Park and enjoy a mix of musical styles performed on our brand new state-of-the-art stage from June 29-August 24. Bring your picnic, favorite beverages, and a smile, we provide the chairs and live music (please leave your pets at home). Visit Cooper Creek every Saturday beginning July 8th for free face painting and balloon artist, as well as a kids play area and a bouncy house. While there, shop, dine or relax by the fountain! Beginning July 16th, Every Friday night, bands of all genres will be kicking off the weekend with music from 4-6 PM. Grab dinner after the music is finished in one of the many Village restaurants, and then head over to the Great Lawn for the Coca-Cola Family Movie Night. Friday is looking good this summer! Visit https://www.winterparkresort.com/things-to-do/events to see who's playing this Friday! Bring your own blankets and picnic or grab one of our bean bags or lounge chairs. But don't worry about your own popcorn, we'll get that for you. The show starts at dusk so make sure to hang out so you don't miss any moments. Visit www.winterparkresort.com/things-to-do to see what family-friendly new release is playing this Friday. TEQUILA, TACOS, LIVE MUSIC AND MORE! 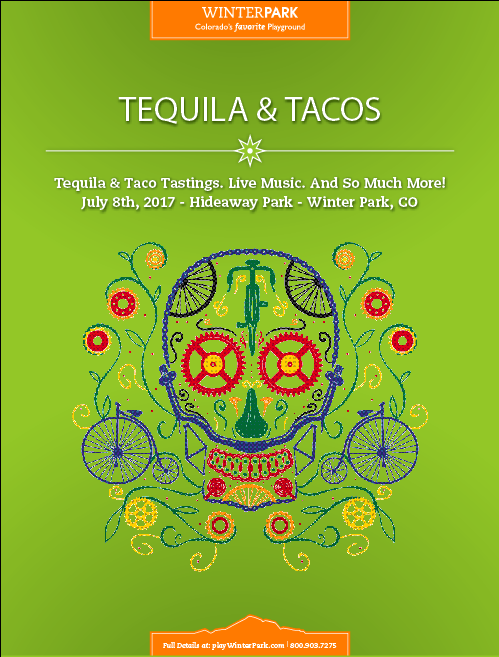 Join us for the 2nd Annual Tequila & Taco Fiesta on July 8, 2017. Winter Park Tequila & Tacos Festival, an afternoon of tequila and taco tasting at Hideaway Park accompanied by live music from The Rick Lewis Project. Click Here to Purchase your tickets! 44th Annual Fine Art & Fine Crafts Fair with Approximately 70 artists featuring fine arts and crafts such as jewelry, Photography, Metalwork, Mixed Media, Pottery, Painting, Glass, Wood, and Fiber. Enjoy Lions Club Pancake Breakfast, HawkQuest Birds of Prey, Children's Activities, Music & Food! Click here for more info! 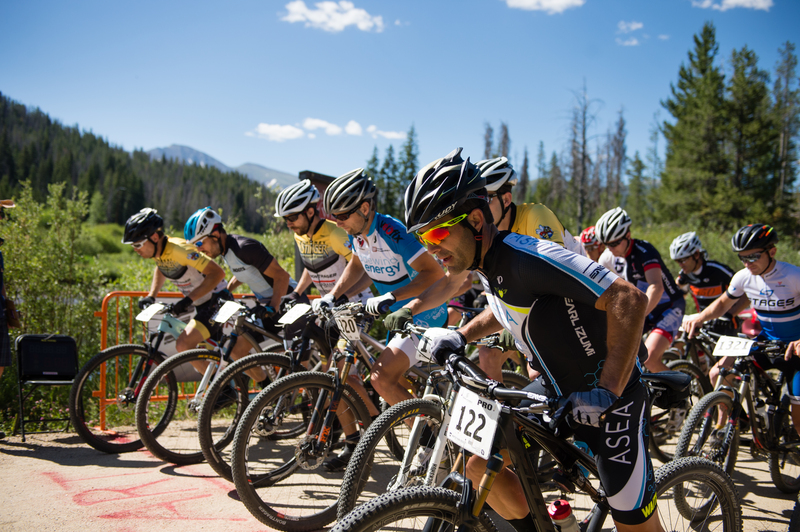 Brush up your mountain bike skills and learn from and ride with Alison Powers and ALP Cycles Coaching along with other high-level mountain bike coaches / professional riders who will offer personalized training and skills clinics for you, your friends, and for everyone! Become a more confident bike rider by dialing in your bike handling skills, confidence, and fitness. This clinic is for all riders, all abilities. Register and learn more, here! The Colorado Freeride Festival, hosted at Trestle Bike Park July 27th-30th, 2017 is a full weekend of all things mountain bike! Join us for race for all ages, lessons, Family activities, bike vendors, and of course the Slopestyle Event that brings world class downhill riders from all over the world! For more info and schedules, click here! 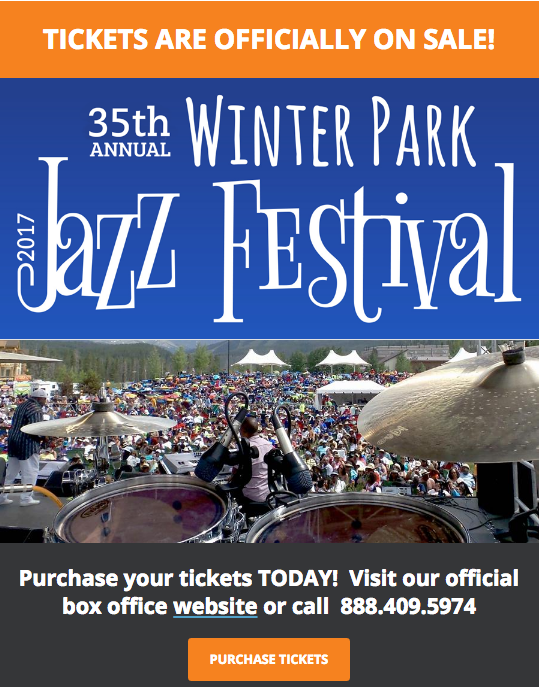 Get more info on these events and more happening in Winter Park this July! Head to PlayWinterPark.com!